A key character is returning to Marvel’s Daredevil. Recently, Netflix announced Vincent D’Onofrio will be back for the TV series’ upcoming third season. 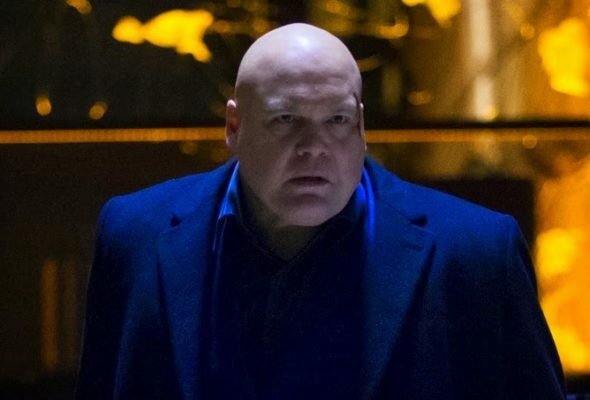 D’Onofrio will be reprising his role as the villainous kingpin Wilson Fisk, which he originated in season one of the Marvel Comics drama. Fellow cast members include Charlie Cox, Deborah Ann Woll, Elden Henson, Rosario Dawson, Jon Bernthal, Élodie Yung, Royce Johnson, and Stephen Rider. Season three of Marvel’s Daredevil is expected to debut on Netflix in 2018. LOS ANGELES, October 25, 2017 – Marvel Television and Netflix announced that award-winning actor Vincent D’Onofrio (The Magnificent Seven, Jurassic World) will return to the highly-anticipated and critically-acclaimed Netflix original series MARVEL’S DAREDEVIL, reprising his role as Wilson Fisk, the powerful businessman whose interests in the future of Hell’s Kitchen brings him into conflict with the blind attorney Matt Murdock and his alter ego Daredevil. All episodes of the first and second seasons of MARVEL’S DAREDEVIL are currently streaming on Netflix, with season three slated for release in 2018. D’Onofrio is joined by returning cast including, Charlie Cox (Matt Murdock/Daredevil), Deborah Ann Woll (Karen Page), and Elden Henson (Foggy Nelson). Additionally, Erik Oleson has joined MARVEL’S DAREDEVIL as showrunner and executive producer. Oleson was most recently head writer and Executive Producer of Man In The High Castle. D’Onofrio starred as Detective Robert Goren in over 100 episodes of the series Law & Order: Criminal Intent. He received an Emmy Award nomination in 1998 for his riveting guest appearance in the Homicide: Life on the Street episode The Subway. D’Onofrio also directed, produced and starred in the short film, Five Minutes, Mr. Welles, and recently appeared in the Academy Award-winning short The New Tenants. He is represented by Silver Lining Entertainment and United Talent Agency. The third season of MARVEL’S DAREDEVIL is Executive Produced by series Showrunner Erik Oleson (“Man In The High Castle” and Drew Goddard (“Cabin in the Woods”), along with Jeph Loeb (“Marvel’s Jessica Jones,” “Marvel’s Luke Cage”) and Jim Chory (“Marvel’s Jessica Jones,” “Marvel’s Luke Cage”). What do you think? Are you a fan of Marvel’s Daredevil? Are you excited for season three? More about: Marvel's Daredevil, Marvel's Daredevil: canceled or renewed?, Netflix TV shows: canceled or renewed?